Hi everyone, I hope you had a wonderfully festive holiday? Mine was certainly busy… August heralds the start of what is always a crazy time of year where time becomes exceedingly precious. This craziness seems to continue all the way through to the new year. It becomes a bit of a vicious loop really, with lots of gatherings filling the calendar paired with the struggle to find (from the rapidly diminishing resource that is) time to make a requested dessert… The more gatherings the less time to bake! flesh of one (fresh) coconut, sliced into short rectangular shaped pieces (you could substitute with shredded coconut or coconut chips). 200ml morello cherry juice (I used the juice from a jar of morello cherries, other cherry juice can be used or you could just ditch the jelly layer altogether). 1. Grease a fluted pie tin, and line the base of the tin with the shortcrust pastry. Blind bake in oven until cooked through. Put aside (or even in the fridge) to cool. 2. Melt about 40g of the chocolate (I do this in the microwave. I start by zapping the chocolate in an uncovered mug (always ensure it is not covered) for 30 secs. Stir. Then put it in for another 10-20 secs (depending on how close to melted it is) and repeat until completely melted. Spread on baking paper (you want a rough circle about 10cm across). Sprinkle with salt. Place in fridge to harden. 2. To make the chocolate ganache filling: Boil the cream in a saucepan, or by microwave in 30 second bursts until boiling. Pour over the remaining chocolate and stir until melted and combined. Add the leftover melted chocolate. Stir until silky and smooth. Pour/ spoon into the tart shell you made in step 1 above. Place in the fridge to solidify. 3. To make the cherry jelly: Soften the gelatin sheets in tepid water. Bring the cherry juice to the boil in a small saucepan. Take the softened gelatin sheet out of the tepid water and place in the boiling juice. Stir until dissolved. Lower the temperature and simmer for a couple of minutes. Remove from heat and allow to cool. 4. While the tart /jelly is cooling, pit the cherries. Try the keep the end of the cherries smooth and uncut. 5. 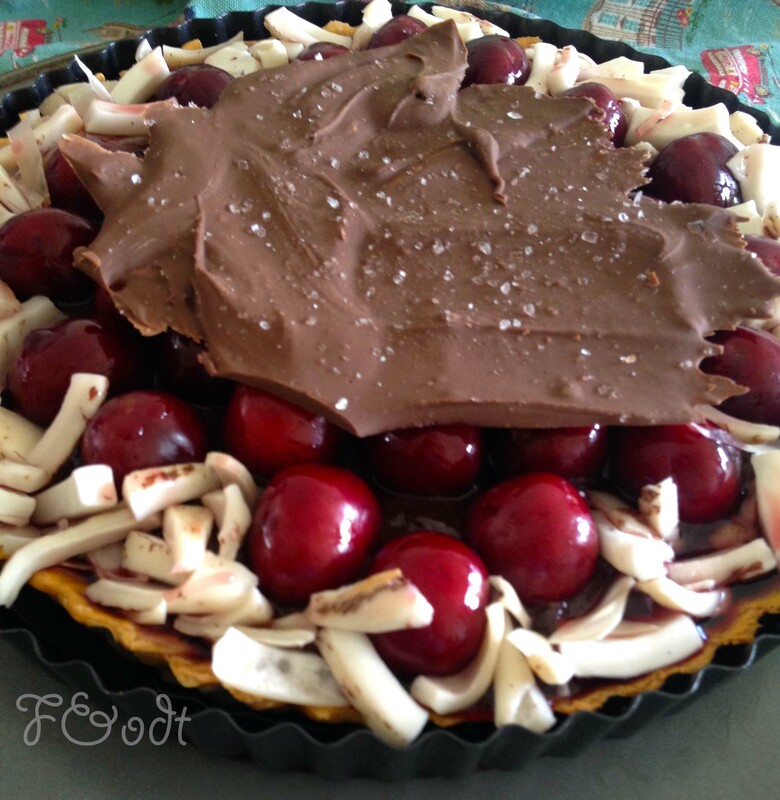 Starting from the centre, place the cherries (open side on the ganache) in concentric circles. Use the coconut to fill the remaining space to the edge of the tart. If the jelly is cool (but still liquid), spoon over cherries. Place tart in the fridge to set. 6. 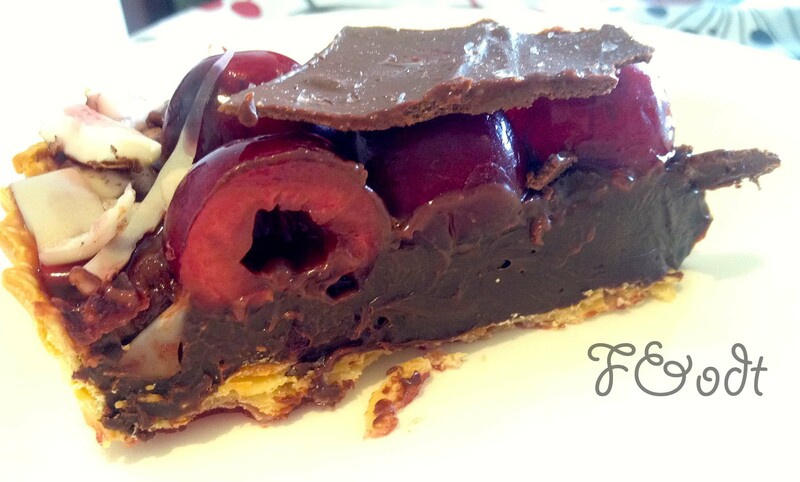 Place the salted chocolate on top (centre of tart) and serve. This entry was posted in Food, Sweets, Uncategorized and tagged cherries, cherry, cherry chocolate tart, Cherry jelly, cherry juice, cherry ripe, cherry ripe pie, cherry ripe tart, cherry tart, chocolate ganache, chocolate tart, coconut, dark chocolate, easy, ganache, jelly, milk chocolate, quick, shortcrust pastry, tart. Bookmark the permalink. 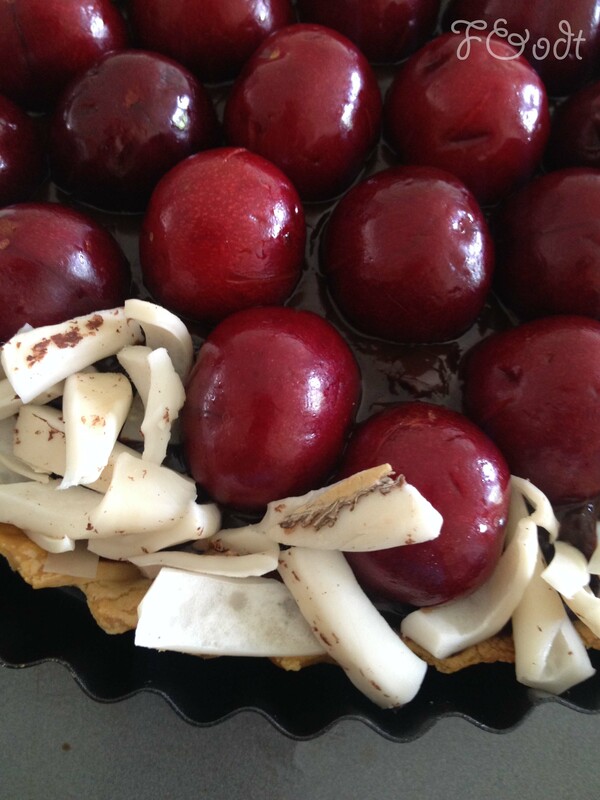 Cherry Ripe Tart seems to be a great dessert… The picture looks yummy. I wanna try to bake it that I might taste it as soon as possible. 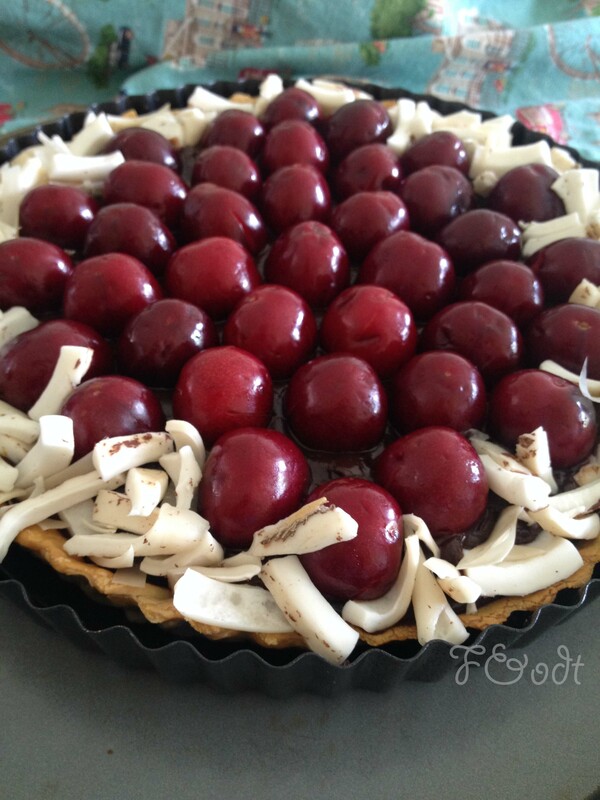 Luckily it’s and easy one (as long as cherries are in season :)) – so bake away!